Facebook is a social media platform that makes it easy for you to connect and share with family and friends online. It is very popular and currently has over 2 billion users worldwide. The 55+ demographic is the largest growing group of people to engage with Facebook. If you have an interest, you will likely find many people you know already on Facebook. 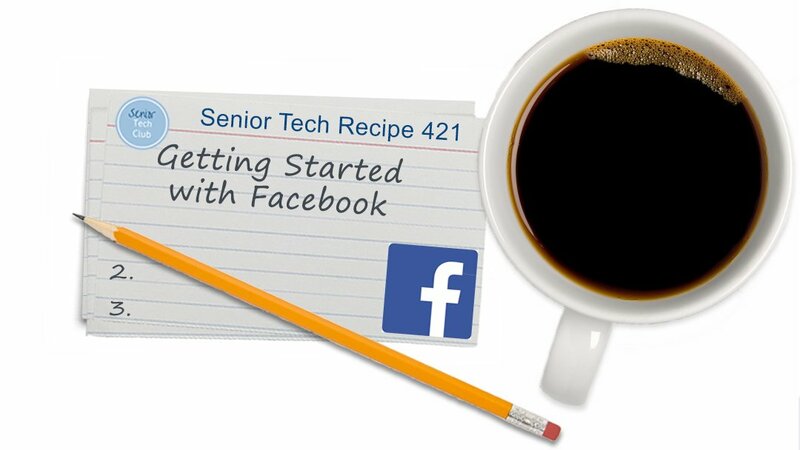 This recipe will help you understand Facebook and how to get started. Use the links below to quickly access specific topic or information about this recipe. Do I need this Recipe? Your feedback is priceless. Please tap the star above that rates the usefulness of this recipe. 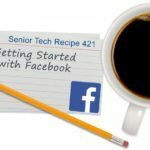 The primary use of Facebook for Seniors is to connect with friends and family. You can look up old schoolmates, share photos with family members, stay in touch with children and grandchildren. Facebook allows you to participate in the lives of friends and family wherever they may be. There are dozens of other reasons why people use Facebook including community engagement, business, games and more. However, for Seniors the primary reason is to connect with friends and family. 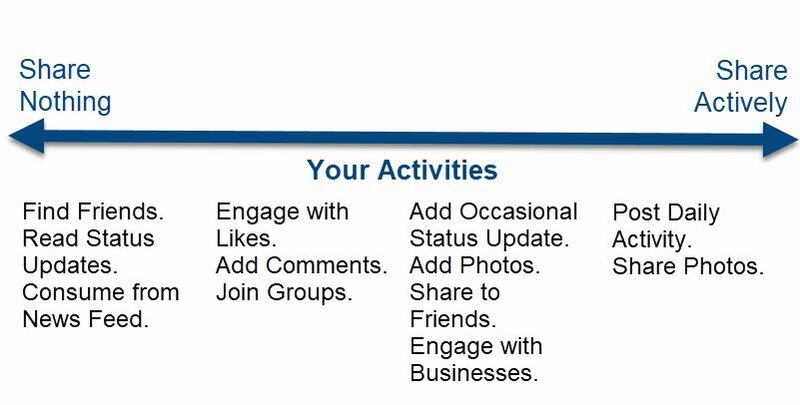 If you decide to use Facebook, you get to choose your level of engagement or sharing. There are millions of people who connect and share details about their lives every single day. These are people who might even share what they are eating for breakfast and how they feel about it!! However, you can choose to engage by simply reading the status updates posted by your friends and family. The choice is yours. For Facebook there are a couple of steps along a spectrum. You can either access Facebook on the web using a web browser or you can access using an app on your iPhone or iPad. If this is the first time you have access Facebook. you will be presented with a Sign Up page. See Set Up a Facebook Account. Here are the essential steps for installing the Facebook App. Access the App Store by tapping the App Store icon on the home screen. 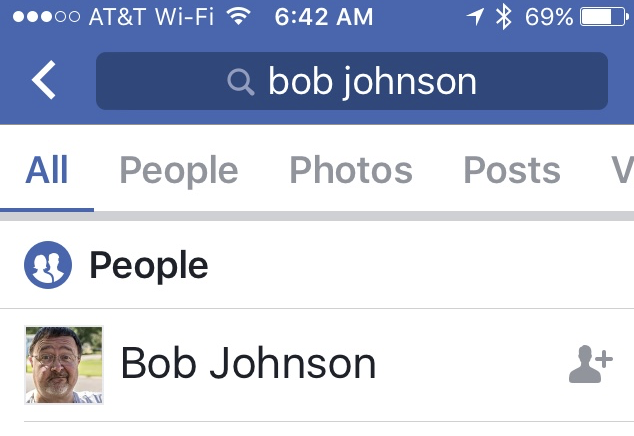 Tap Search and enter Facebook into the search bar. 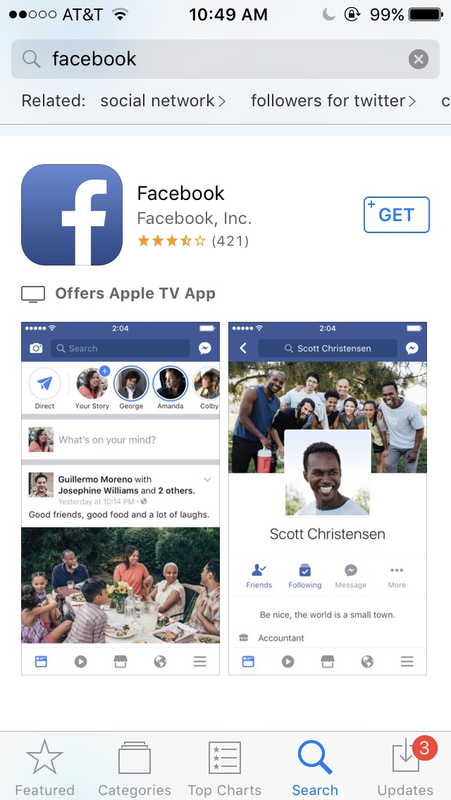 Tap on the search result titled Facebook by Facebook, Inc.
Facebook App in the App Store. Remember Get means it is Free. Tap Get and them tap Install to install. Provide your Apple ID or Touch ID to approve the installation. Facebook uses terminology that may seem a bit foreign to our generation. Here are some common Facebook terms and their definitions. Your Timeline is the information you share. It is your personal page and will contain whatever you post including your photos, your friends list, your activities and interests, and any information like schools, jobs and family that you wish to share. Your timeline is where you will share any information and where friends will post information for you. The News Feed is NOT news as we would read in a newspaper or the evening TV news. Rather it is the stream of updates and photos posted by your friends that appears on your Home page. 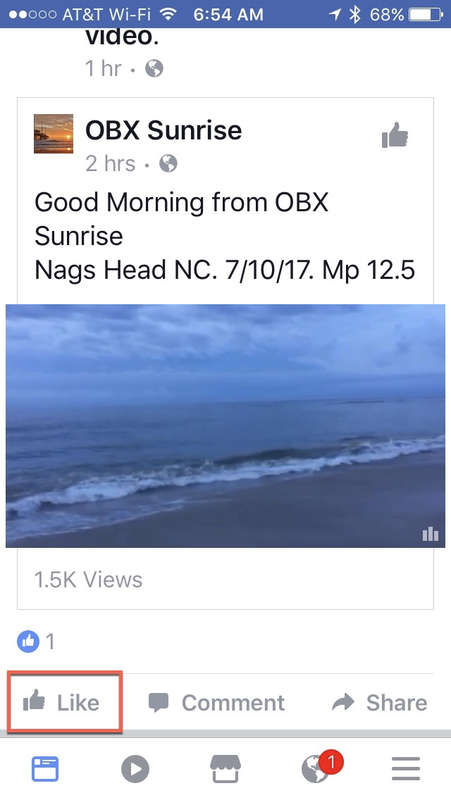 Your Home page is what you see when you log into Facebook. It presents your News Feed. A Friend is someone you’re connected to on Facebook. A Friend Request starts the process of “friending. All friendships must be confirmed by both people in order for the friendship to be official on Facebook. You do not have be accept a Friend Request from someone you do not know well. A Status Update is something that you wish to share. A status updates are likely a short post or description (example), a picture is very common. People can do a status update on any range of topics including what they are eating for breakfast to a treatise on a political position. A business creates an ad. They choose the type of audience they’d like to reach. 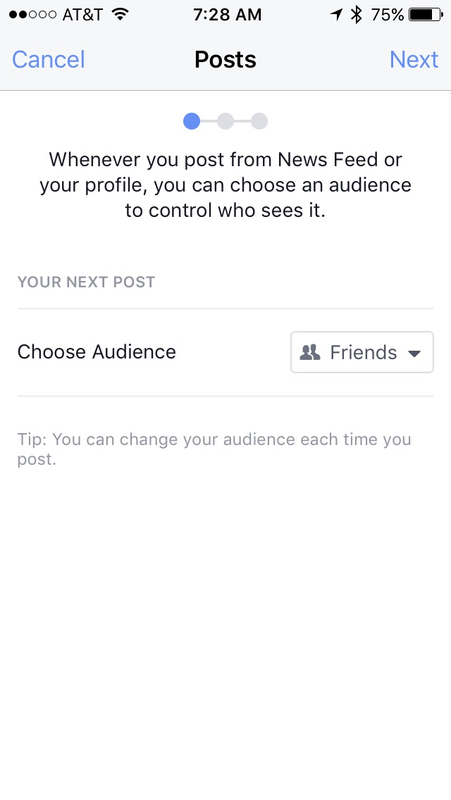 If you’re in that audience, Facebook shows you the ad. Businesses use Pages as a public page or profile for their business. If you want your business to have a presence on Facebook, you would create a page to build relationships and find customers. Look up “Target” to see an example of a business page. Groups are places where people with common interests come together. It might be a community group (Village People), alumni groups, former colleagues at a common employer, or business groups. 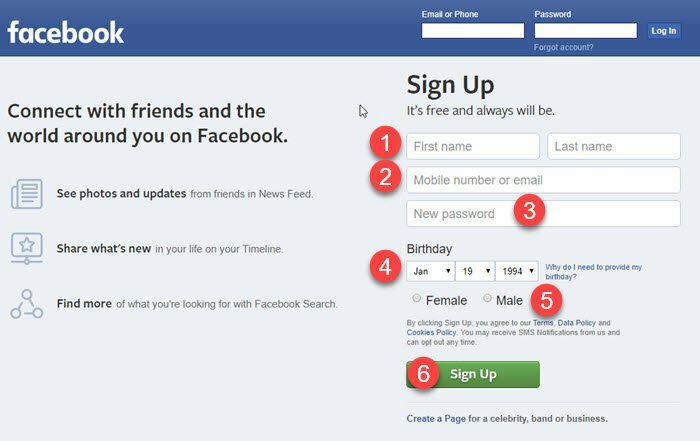 The first time you access Facebook, you will be given an opportunity to sign up for a Facebook account as you see here. Phone number or email as your primary login. It is better to use a personal email rather than a business email. Password – enter a strong password that you can remember. Please write this down. Tap or click Sign Up. At the end of the process, you will be asked for your mobile phone number or am email where Facebook will send you a confirmation instructions. This step is to ensure that this is a valid account application. Additionally, there will be steps for your to follow to find friends, upload a profile picture, learn about privacy settings, and more. Skip steps that you are uncertain about. You can do these steps later. For example, the setup process will ask you to start the process of finding friends. Skip that process for a later time. 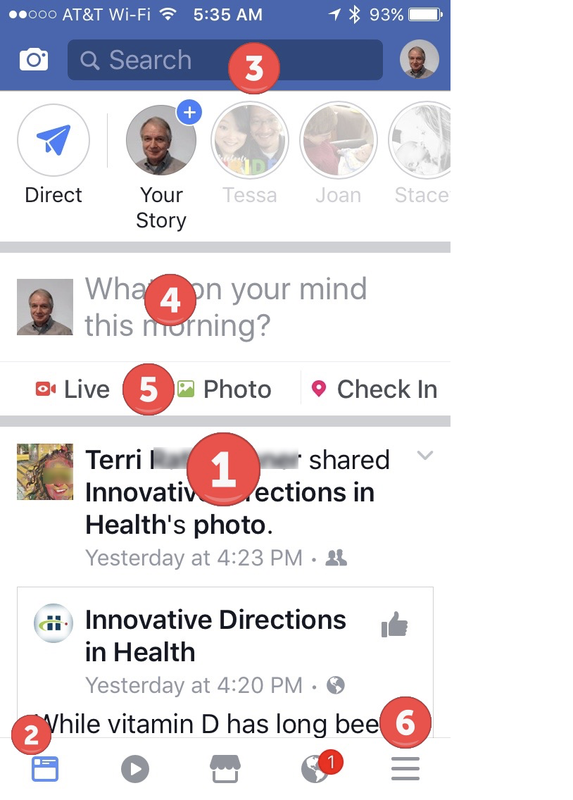 The following screen will provide information about basic app navigation and the process of sharing and reading your newsfeed. The numbers on the screen correspond to the list below. 1 Newsfeed – Your Newsfeed is the central element of your Facebook app and presents your stream of information comprised of Status Updates from your friends and Pages that you like in addition to Ads or Promoted updates. Swipe up to scroll down your newsfeed to read additional items. 2 Newsfeed Icon – Access your newsfeed by tapping the Newsfeed Icon. 3 Search – Use the search bar to search for people, businesses or organizations. 4 Status Updates – When you are ready to provide a Status Update about your life or interests. Tap What’s on your mind where you can type post information. Status Updates often include photos or videos or can be simply text that you type. 5 Photo A photo is a great way to get started with sharing. In additional to adding a photo to a Status Update, you can also upload photos to a photo album that you can share with Friends. If you are a parent or grandparent, you actually hope that your children are sharing photos on Facebook. Tap Photo in order to access your photo library. Or you can tap the Camera icon in order to post a new picture from your camera. 6 More – The More icon provides access to your profile, shortcuts and settings. Select their name to confirm details about the friend. Make sure it is the right “friend.” Their picture should help. Someone cannot be your Facebook friend until they approve the request. It is truly a two part process, the request and approval. 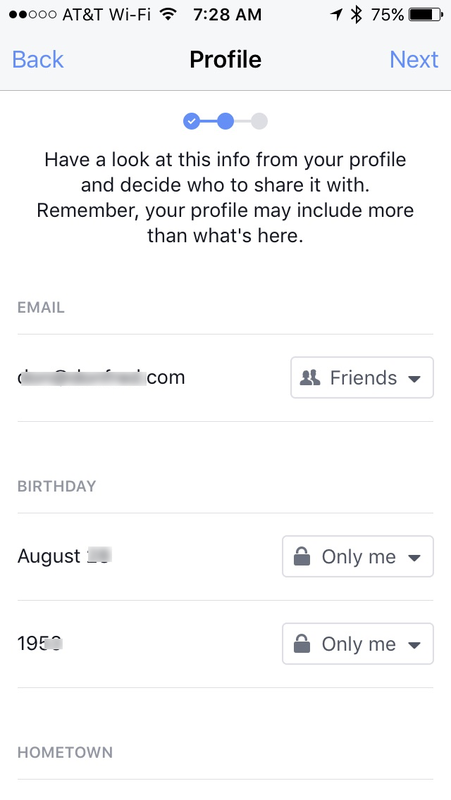 As you build your membership list, Facebook will recommend friends based on mutual friends and assumed connections. You can also explore the friends of your friends looking for mutual friends. Keep your Friends Close! An standard privacy tip, do NOT accept friend requests from people you do not know. On the iPhone app, explore these friendship ideas by tapping More, Friends. Keep your friends list to real friends. This way you can generally share information with friends. Understand that when you share or post, you can share with friends or the public. If you feel confident with your friends list, it makes sharing easier. Don’t share identity data. For example, don’t share your birth date or if you choose to share your birth date, you do not have to share the year. Generally don’t share location information. Use the Privacy Checkup function. Tap More, Scroll down and tap Privacy Checkup. Tap Continue on the Welcome to your Privacy Check! screen. Use this function regularly to identify who sees your information. The Facebook platform with all of its terms, privacy elements, ads, games, news and groups can be daunting for a beginner. On top of this, family members often pressure Seniors to use Facebook. 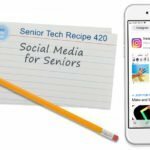 But with a methodical recipe as your guide, you will soon be able to experience the level of Facebook engagement that is right for you. Understand Facebook role and basic terminology. Before you sign up, have some basic understanding of what Facebook is and why you might want to use Facebook. Install the App or use www.facebook.com on your desktop or laptop computer. You can use both with the same account. Create a Facebook account. Use your email as the login and record your password. Skip the step to add friends in order to perform this step later with more control over the process. Add your picture to your profile to help your friends identify you. Find a few friends. Look them up in the search bar by name, email or mobile phone number. Send a friend request. As a privacy approach, keep your friends list to good friends at the beginning. You can expand later after you are more comfortable with the application. Spend some days, even weeks only reading updates from your friends. It is OK to be a lurker while building your confidence. “Liking” the updates of your friends is a easy way to let people know you are there. It also you to learn good Facebook etiquette while engaging. Use photos for your initial status updates. It’s a good way to get started with events and only requires a few words of text. See that you are only sharing your updates with friends. Expand beyond friends by engaging with one or more Facebook groups. Search for community groups of interest to you and join or request membership. Be a lurker until you have confidence to engage. Search for groups associated with your hometown, school alumni, former employers, churches and community groups. Keep Exploring as you are comfortable. Your Facebook experience can include much more like games, events and more. Use the following four questions to determine if you understand the skills taught in this lesson. What are the two methods to access Facebook? If you use Facebook do you have to share information about your life? You should accept all Friend requests? 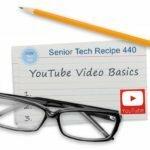 If you would like to have additional online training, the Senior Tech Club recommends the free courses found at GCFLearnFree.org. You can type a question or comment about this recipe below. This information is only seen my club members. It is a safe place to ask your questions. Type your question or comment and tap SUBMIT COMMENT.